Some 500 different titles of books were transported to the island of Manicani in Guiuan, Eastern Samar, to fill up a new library. 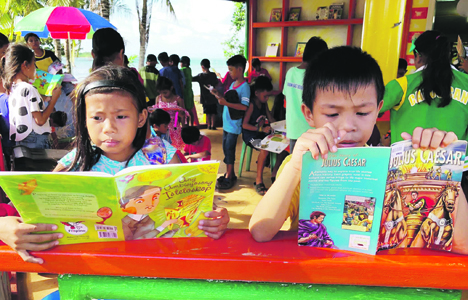 Children of Manicani Island read from the books supplied by employees of Nickel Asia Corp. for the ‘Ang Library sa Manicani’, which makes up for the absence of a public library on the island, which is 45 minutes away by boat from the town of Guiuan in Eastern Samar. Simply called “Ang Library sa Manicani,” the project aims to encourage children in the island to read, with Nickel Asia Corp. making sure there are exciting books, some with very special and rare titles, as well as magazines, available in the new library to sustain the interest of everyone on the island. Manicani only has one high school and one elementary school serving almost 700 children, including those too young to enter formal school. There is no public library in the island, which is 45 minutes away by boat from the town of Guiuan in Eastern Samar, and the library that NAC built is designed like a resort. Painted in bright inviting colors, it is surrounded by fiesta-fun flags and beach umbrellas, so the children will be excited to visit and check out the books. NAC employees donated books for all ages – classics, masterworks, and contemporary, in Filipino and in English, pre-loved and newly bought – in participating with the company’s personal social responsibility (PSR) program. Books from Agatha Christie to Harper Lee; from Wimpy Kids to Robinson Crusoe; from volumes of young adult romance books to hard-reads like Jane Austen and Lewis Carrol were donated to the library. Copies of titles from Mark Twain, Anne Rice, Disney books, Grolier Illustrated and Encyclopedias, local author Bob Ong, and even entrepreneurial magazines, self-help bestsellers, and religious journals were included.